Following my earlier post on the legacy of computer pioneer Alan M Turing (Turing’s Legacy), Turing’s achievements have again hit the headlines with the news last week that members of the Institution of Mechanical Engineers (IMechE) have voted the Bombe at Bletchley Park as their favourite Engineering Heritage Award winner from the past 30 years. The Bombe was an electromechanical code-breaking device which emulated the rotors of an Enigma machine, the typewriter-like device used by the German military to encrypt radio messages during World War II. It employed a motorised mechanism to step rapidly through every possible combination of rotor settings and apply a logical test to each one to determine if it met the conditions for a possible solution which had been wired into the machine before operation. 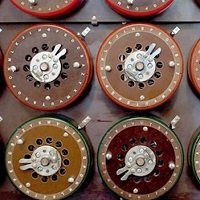 The Bombe was closely based on an earlier device developed by the Polish Cipher Bureau in 1938. Alan Turing improved the Polish design by incorporating 36 sets of rotors to allow multiple checks to be made in parallel. Turing’s design was then turned into a fully-engineered device by the British Tabulating Machine Company under the direction of chief engineer Harold H Keen. I must confess to being somewhat surprised by the result of the IMechE vote, as the Bombe was a workmanlike device which employed a brute force approach to cryptanalysis and lacks the sophistication and ingenuity of later developments at Bletchley Park (although these later developments employed electronic technology which probably renders them ineligible). It also ranks low in terms of Alan Turing’s achievements, as the concept was not entirely his. There have been 100 winners of the Engineering Heritage Award to date, so the IMechE members had many other remarkable examples of engineering excellence to choose from, including the world’s first supersonic airliner, Concorde, which came second in the vote. The fact that they chose something designed by Alan Turing may be due in part to the high level of media attention he is receiving at the moment. This attention is likely to increase further with the release next month of the Hollywood film The Imitation Game, a dramatised account of Turing’s cryptanalysis work at Bletchley Park during World War II. Let’s hope the filmmakers have done their research and that Turing’s achievements are portrayed accurately. I certainly plan to go see it and will report back in a future post. This entry was posted in Uncategorized and tagged Alan Turing, Institution of Mechanical Engineers on 15/10/2014 by Stephen J Marshall.